Just like people, dogs need regular dental care, but unfortunately, dental hygiene for dogs is sometimes overlooked. Many people seem to just expect dogs to have bad breath, and few people brush their dogs’ teeth frequently enough. Dental hygiene is just as important to your dog’s overall health as things like nutrition, proper exercise, and routine grooming. Plaque builds up on the teeth and turns into tartar, also called calculus. These areas grow bacteria and eat away at the teeth and gums. Halitosis, periodontal disease, oral pain, and tooth loss can occur. However, the bacteria not only cause disease in the mouth; they can also affect other parts of the body, like the heart and kidneys. The most important thing to do is address dental disease as soon as it is detected, no matter how minor. Catching teeth problems early will help avoid severe dental disease. The simplest way to keep track of your dog’s teeth is to look at them on a regular basis and be aware of signs that may indicate a problem. To inspect your dog’s teeth, lift the lips all around the mouth, looking at the front and back teeth as closely as possible. Be gentle and use caution so you do not startle your dog (and may get you bitten). There are several things you can do to help keep your dog’s teeth in good shape. Start a dental care routine as early as possible in your dog’s life and stick with it. Tooth brushing is the best preventive measure when it comes to oral hygiene and should be done every two to three days in order to be most effective. Start when your dog is a puppy so it gets used to the feeling of having its teeth brushed. Puppies have 28 deciduous teeth that typically fall out by about six months of age. By this time, your dog should be on a regular tooth brushing routine. 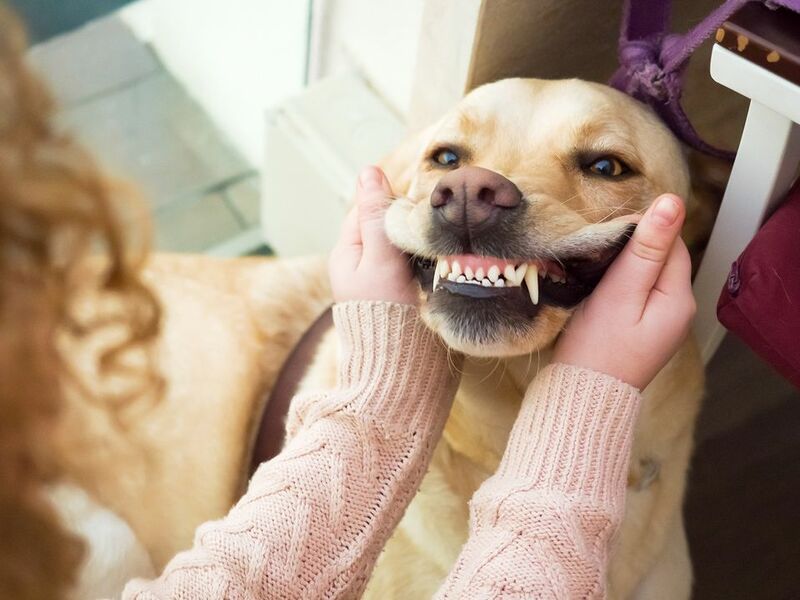 When your dog gets older, it may need dental cleanings more regularly, as its teeth weaken (and in some cases, fall out), and it is more susceptible to periodontal disease, which can become serious. There are specially designed toothbrushes which are better suited for dogs' teeth and easier to use than the ones designed for people. Some are shaped like small finger caps; you slip the cap over your index finger and rub the dog's teeth with the textured surface. Others are designed as chew toys; as your dog gnaws on the "brush" its teeth are gently scraped clean. From time to time, your veterinarian may recommend a professional dental cleaning. This requires general anesthesia. During the procedure, your dog’s teeth and gums will be examined closely for problems. The teeth will then be scaled and polished, to remove any grooves in the teeth. Note that while some dog groomers may offer a tooth cleaning service, don't expect to get a deep cleaning. They can brush the dog's teeth just like you could at home, but for a thorough, complete cleaning, the gums need to be inspected. This isn't something that should be done while the dog is awake. If your dog does have tooth decay or other dental problems, the vet may refer you to an oral surgeon to extract the affected teeth. Some dogs need dental cleanings one or more times per year while others can go longer. Be sure to follow your vet’s recommendations. If you are unable or unwilling to brush your dog's teeth every day or two, look for an alternative, such as special dental chews or a food/water additive. Not all products are equally effective, so ask your vet for recommendations. Dental chews should be easily digestible and size-appropriate. Typically, dental chews need to be given on a daily basis in order to be effective and should be large enough that your dog has to chew on them a bit before swallowing. Food additives are used on a daily basis as well. If you use water additives, be sure to change the water daily. If you're not brushing your dog's teeth, be sure to have your veterinarian check closely for any signs of dental disease; while somewhat helpful, dental chews and rinses are usually only partially effective.